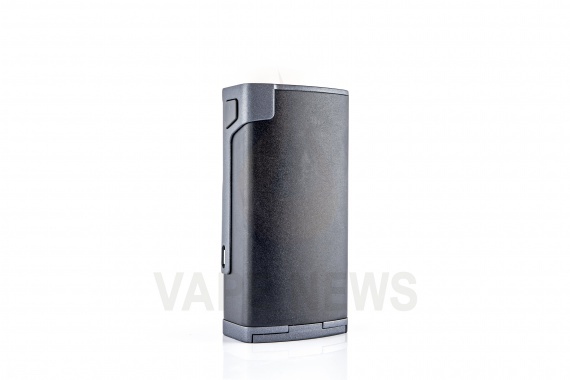 I admit honestly – since the release of the Sigelei 213W, it was interesting for me to touch this device. Firstly, because it had a very interesting design, secondly, because very modest (by the standards of devices with comparable output power) dimensions were added to the design, and, of course, because it was interesting to understand what was inside for a fee and how it works. 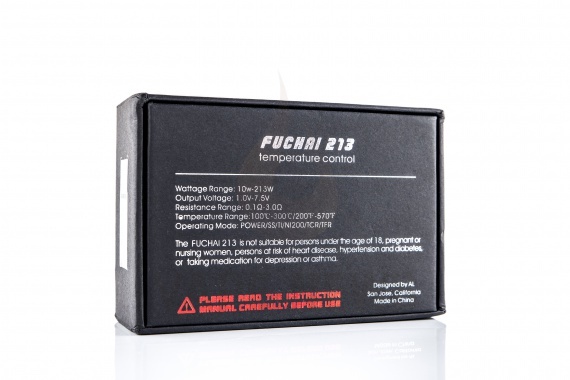 But with the usual Sigelei 213W did not work out, but we got into the hands of a “simplified” version without carbon in the case, but with the same board and the same design – Sigelei Fuchai 213W . The differences are purely “cosmetic”, so in general – it will do. 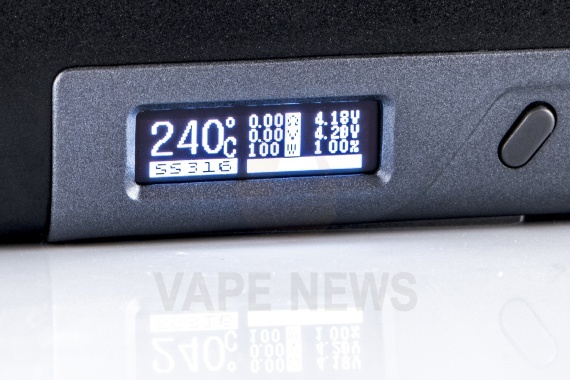 As you can see, there are few changes in the overall design relative to its predecessor in the face of the Sigelei 213W . A slightly different color scheme, the absence of carbon, which was replaced by aluminum and in general – everything. On the reverse side, the device looks even slightly boring, on the other hand, it’s better than if there was any ridiculous logo there. 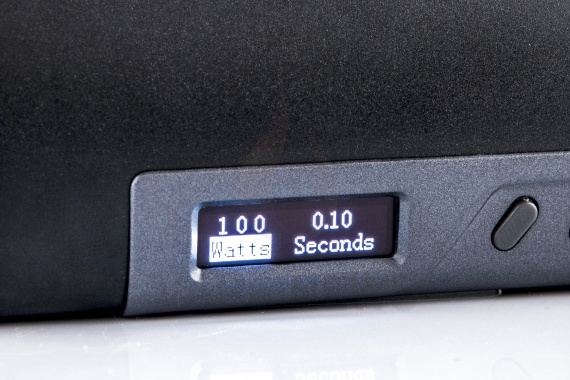 The power supply button is large, ergonomically located and has a very clear tactile response. It is pressed easily, but at the same time it produces a very distinct click, which I would call even a slightly loud one. The buttons “+” and “-” are small, but at the same time spaced enough to be comfortable. There are no problems with their use. You can also pay attention to the microUSB port, located near the screen from the end, but about it a little later. The display device is quite bright and just displays a bunch of information, and not very useful. In short, a lot of information. For example, to know the voltage of each battery with an accuracy of hundredths of a volt is completely redundant, but it is and you have to live with it. On the other hand, if you are a fan of control – delight is provided, so many parameters at a time will not show you any more board. The device allows you to configure the Preheat mode , you can choose the power and time in seconds during which this power will be supplied. This only works in TC mode, but I would also like to use it in a version … A very useful function when using spirals that heat up for a long time (all kinds of fused, staggered clapton, etc.). The mode selection menu is also graphical, convenient, triggered by pressing the power button three times. On the display that’s all. Regarding the work of thermal control: TC here is very good, at least according to my feelings. 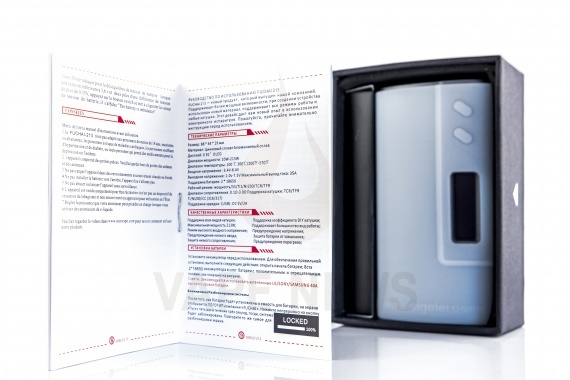 In comparison with the devices on the DNA, it is slightly inferior, but in general it works. Immediately I will clarify – I am not a fan of shopping mall and I am floating in the variation. TK I do not like. And therefore, I argue not after a half-month test of burning cotton, but stupidly after half an hour of soaring a tank with a coil of titanium, relying solely on my own feelings. Connector pleased. Massive, steel, quality. There are grooves so that the devices do not “stick” to the connector in case of liquid between them. The central contact is spring loaded and coated with gold. In general – in this respect, everything is great. 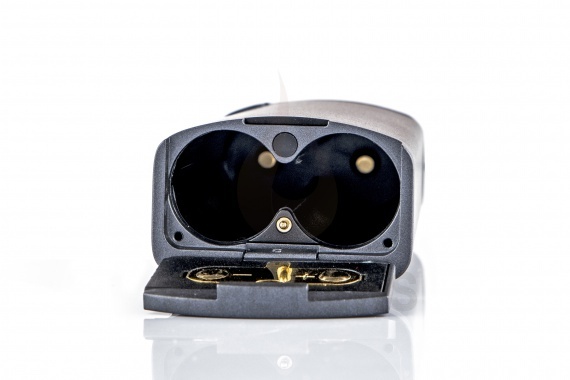 The contacts on the cover are gold-plated and labeled with polarity. Inside the battery compartment contacts are also gold-plated, spring-loaded. The device receives power from two batteries of 18650 format. As I already mentioned, the microUSB port is located at the end, it is intended only for charging, with a current of up to 2A. Software update is not supported. 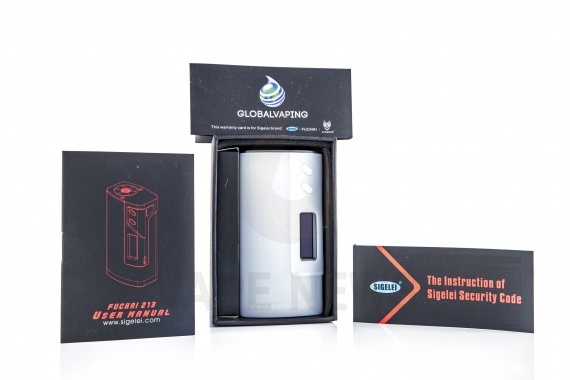 The box is rather solid and of high quality, we have the device’s symbols and a sticker on the front that indicates the color and the address of the manufacturer’s website. 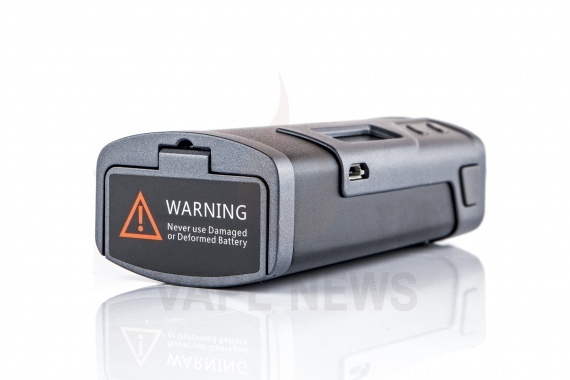 Behind – a brief description of the device and warnings. Inside is the device itself in a complete white silicone case and various books – a guarantee, a brief and complete guide. What pleased us is the instruction in Russian! . Yes, the translation is not perfect, but it is and it is very good. 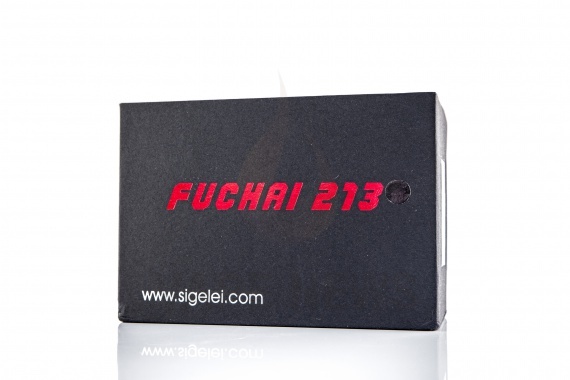 The package is not rich and consists only of the Sigelei Fuchai 213W itself , the charging cable and the case. The cover is very high quality, it fits perfectly on the device and is pleasant to the touch. 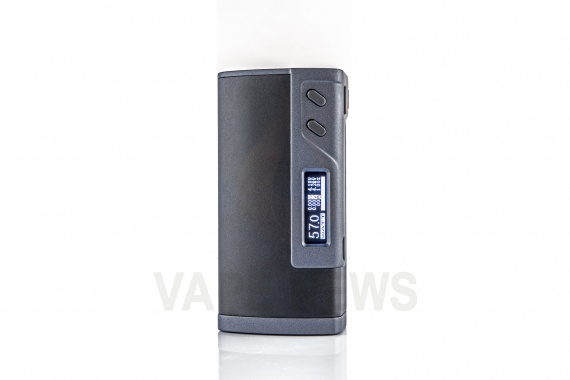 In my opinion, the Sigelei Fuchai 213W is an excellent device for those who are looking for a compact and lightweight mod with high output power and extensive functionality. The overall fabrication quality of the device is excellent, the design pleases, the display that simply displays everything you can think of respects, well, a lot of thermal control settings allow you to adjust it to yourself and achieve almost perfect work with direct hands. From the comments I would like to note a slight overload of the display with information – one could add the possibility of choosing between, say, “professional” and “ordinary” modes, so as not to embarrass beginners and just people uninitiated with an abundance of numbers. On the other hand, this is more likely a niggle. I also didn’t quite like the matte finish of the protruding parts of the case (with buttons, around the display, etc.). In the version of Sigelei 213W in the color of Gunmetal it was more interesting, but … probably more expensive in production, so again a nagging. Finding objective deficiencies is really difficult. Yes, the board is most likely not with any resistance and not with any batteries can issue its 213W… but show me a man who regularly rises to such power? I haven’t seen one yet. Yes, thermocontrol is not perfect, but with proper skill it is configured and works very well. 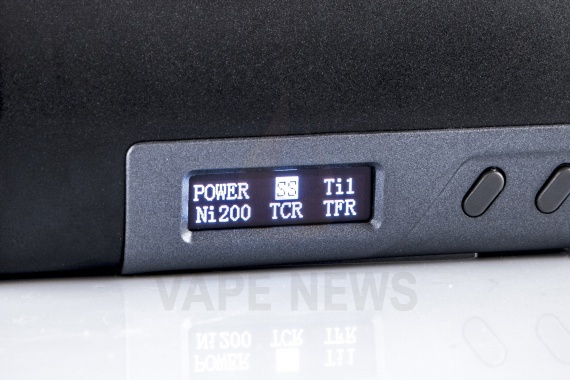 In short, the Fuchai 213W in all respects is at least a good device. You want the most honest power and the best TK – take DNA. Expensive? Well, what did you want? In this case, for your money, the device is very pleasant.